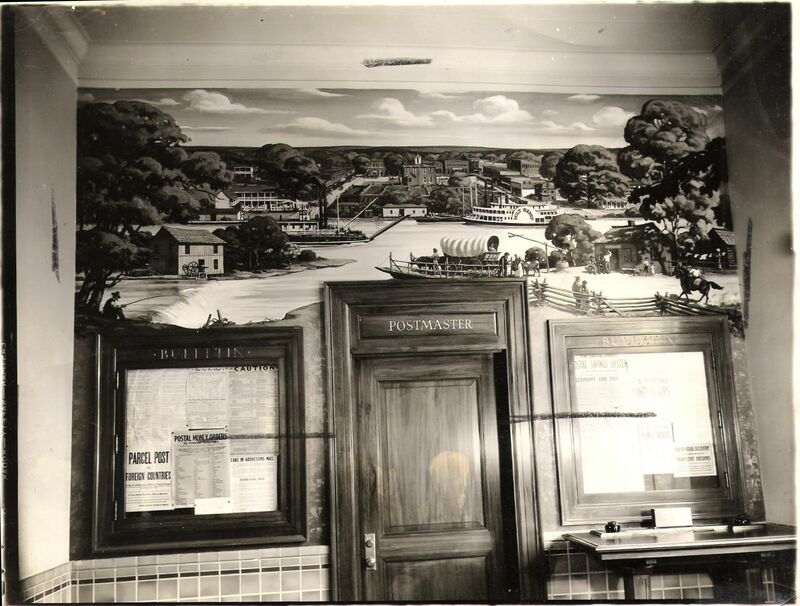 This mural, depicting early scenes from Pocahontas and Randolph County, was painted during the Great Depression by H. Louis Freund, resident artist of Hendrix College, Conway, and placed in the old Pocahontas Post Office by the Bureau of Fine Arts of the U.S. Treasury Department. 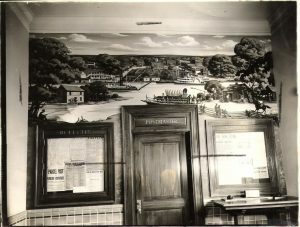 When the Post Office moved to new facilities in the late 20th century, the mural was removed and is currently held by the Arkansas State University museum. The first road in the nation west of the Mississippi River to receive Federal recognition was the Old Military Road. This was the first real road in the State to carry settlers traveling overland to the West. It started as nothing more than an Indian trail known as the Natchitoches Trail. Since it was such an often used trail, it soon became a true road and the only road in the County until 1832. It was used as early as 1800 and connected Pittman (Hix Ferry or Currents), Supply, Maynard, Attica, and Jackson. On March 3, 1831, Congress appropriated $15,000 to build the highway across Randolph County to Washington Arkansas. $14.00 per mile was allowed for construction between Jackson to the Eleven Point River. $18.75 per mile was allowed for construction between the Eleven Point River and Fourche De Thomas, and from Fourche De Thomas to the Missouri line, $8.50 per mile was allowed. The Natchitoches Trail went to Davidsonville, but the Military Road bypassed Davidsonville thus leading to its demise. Davidsonville was the first town in Arkansas to be bypassed by a “US Highway”. The first court in Arkansas was established on April of 1815 at the home of Solomon Hewitt. The home was located on the east side of Spring River, 2 miles north of the mouth of the Eleven Point River. The first trial in Arkansas was between Thomas Graves and James Haddock over the ownership of some hogs. It was held at the Hewitt home. The first ferry boat in the State of Arkansas was the Hix Ferry. The ferry was located in the Northeast comer of Arkansas and crossed the Current River at a location first known as Currents. It began around 1800 and was operated by William Hix. It was later purchased and operated by P. R. Pittman and the area is still known as Pittman’s Ferry near the community of Pittman. Thousands of Confederate Troops camped and trained at Pittman’s Ferry and launched raids in Missouri from that point under the command of General Sterling Price. The first Post Office in Arkansas was located at Davidsonville in 1817. Davidsonville, and on to Batesville. Later the route went from St. Louis to Monroe, LA via the Old Military Road. The second mail route into Arkansas was from Memphis. The first telegraph line in North East Arkansas was along the Old Military Road. The first Steam Boat to come up the Black River to Randolph County was the Laurel in 1829. The first Baptist Church in Arkansas was built in Randolph County and was known as the Salem Church. It was located at Columbia (Fourche De Thomas) in 1818. The first school in Arkansas was held in a cave at Ravenden Springs sometime prior to 1820, and the teacher was Caleb Lindsey. Randolph County produced the only Arkansas Governor to resign while in office due to low pay. Governor Thomas S. Drew was the only governor ever to be elected from Randolph County. While in office Governor Drew proclaimed December 7,1847 as the first Thanksgiving Day ever celebrated in Arkansas. He died in 1879 in Texas and in 1923 was moved back to Pocahontas and buried in the Masonic Cemetery. The first Court House Building in Arkansas was located at Davidsonville in 1820. The first Land Office in Arkansas was located at Davidsonville in 1820. Pocahontas has the longest continuously operating barber shop in Arkansas. De Munn Mill was the first mill built in Arkansas and was located at the Southern edge of Pocahontas near the mouth of Mill Creek. It was built in the year 1822. The first Masonic Lodge in Arkansas was built in Randolph County and located in the Brakebill Community. The first news papers in Randolph County started in 1858. Both were in Pocahontas and were known as the Herald and the Weekly Advertiser. The oldest standing home in the State of Arkansas remains in Randolph County. The home was built in 1827 or 1828 by the Upshaw family, and remains in possession today by descendants of the same Upshaw family. The logs used in the home date back to the 1600’s. The home is located near Dalton. The oldest standing business in the State of Arkansas also remains in Randolph County. It was built near 1833 and is known as the Looney house. It was operated as a tavern or inn. The building is along the Eleven Point River near Dalton. There is some evidence that DeSoto was the first white man to set foot in Randolph County near the year 1541. There was a French trading post in Pocahontas between 1760 and 1790. Randolph County has been owned by Spain, France, and by Spain again before selling it to the United States (the Louisiana Purchase). Randolph County has been part of the District of Louisiana, District of New Madrid, the County of New Madrid (Missouri), County of Lawrence (Territory of Missouri), County of Lawrence (Territory of Arkansas), and finally became Randolph County on October 29, 1835. This was one year prior to Arkansas becoming a state. One of the early permanent residents of Randolph County was believed to be John Janes who settled on what is now known as Janes Creek in the year 1809. Davidsonville was the county seat from sometime prior to 1815 until 1829 when it was mover to Jackson. Jackson served as the county seat from 1829 to 1837. Both towns mysteriously passed from existence soon after they ceased to serve as county seats. In 1836, Randolph County had three different ferry boats operating. They were charged fees in order to operate. Thomas Black ran a ferry at Blacks Ferry and paid $2.00 per year for that site. Ransom Bettis operated the ferry at Pocahontas and also paid a $2.00 fee per year. The Pittman Ferry was such a busy ferry that the fee for that site was $5.00 per year. This was in all likelihood the first revenue for Randolph County directly tied to the “tourist trade”. At one time there were 99 school districts in Randolph County. The first courthouse in Pocahontas was built in 1837. It was a two story structure and measured 40 feet by 40 feet and built at a cost of $2400. In 1870, the courthouse collapsed and was replaced by what is today known as the “Old Courthouse” which was completed in 1875. Pocahontas was first known as Bettis Bluff and was chosen as the County Seat over Old Columbia (Fourche De Thomas or Biggers) only after Ransom Bettis and Thomas Drew threw a free barbecue with plenty of liquor flowing. The election was held shortly thereafter. Ransom Bettis is credited as the founder of Pocahontas. The first train to arrive in Pocahontas was in 1896 and was known as the Hoxie-Pocahontas and Northern Railway Company. The first train in Randolph County came through O’kean in December of 1872 and was -the Iron Mountain Line. On August 29,1861, General William J. Hardee took command of 10,000 Confederate troops which were located southwest of Pocahontas near the mouth of Mill Creek. Between 1870 and 1905, there was a 40 room hotel at Warm Springs. This was a resort used by people coming to bathe in the healing waters of the warm springs in the area. The mineral water was touted to have healing properties for those who had stomach problems. Famous people who came down the Old Military Road include Sam Houston, David Crockett, General John C. Fremont, Henry R. Schoolcraft, Nuttall the explorer. General Sterling Price, President U.S. Grant, Governor James S. Conway, and General Archibald Yell. stadium at Pocahontas is named after this -great player. In the late 1800’s and early 1900’s there was an African American living at Biggers named Coleman C. Scott. While living in Randolph County, he became very wealthy, owning as much as 1000 acres of land. Scotts Ferry was names after him as was Scott Street in Biggers (which remains today). Pocahontas has two of the oldest pharmacies in Arkansas. City Pharmacy began as Skinner Pharmacy in 1886. Futrell Pharmacy it was first operated by the Black family in 1872 or 1873. It moved to its present location in 1895 and has remained in that location ever since, although it was closed for a short time when the two story structure burned and it became a one story structure afterwards. Futrell Pharmacy is certainly one of the oldest pharmacies in Arkansas to remain in the same location.